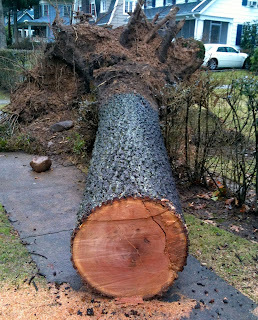 On Saturday afternoon, a gust of wind blew down a big branch from a tree in front of my house. A spectacular arc of electricity made me think we had been struck by lightning, but it was just the branch knocking out electric service on my block. So here I am on Monday afternoon, sitting in a local Starbucks powering up the batteries of my laptop and phone, listening to jazz music along with other power refugees. The WiFi tells me it's Fireheads, by Emiliana Torrini, from the Me And Armini album. I'm offered a download button, and a click later, I'm in iTunes, with a chance to buy. When I said in my last post that libraries and publishers need to work out a new way to work together in the ebook future, I was thinking of something like a cross between Starbucks and the Storefront Library. Here and now, on a rain day in the wake of a nasty Nor'easter, I can see it quite clearly. There are already bookshelves (filled with coffee) and plenty of outlets. Add more comfy chairs and a room for the kids, and this Starbucks could work quite nicely as an ebook library. If it can work for music, why not do the same thing for ebooks? Give patrons access to a huge library of books that can be read for free on the library premises; if they want to take it home on the reader device, they have to buy it. It seems like a reasonable quid pro quo for both libraries and publishers. But then I started thinking. What if it's NOT libraries that do this? What if Starbucks decides someday to get into the ebook distribution business? What if publishers decide that they're more comfortable doing a guaranteed-revenue-stream deal with a single for-profit entity with over 16,000 locations worldwide than trying to roll out service in thousands of public libraries, each of them different in their own special way. Would public libraries become marginalized? Would people without money to spend on an iPad and expensive coffee be able to find ways to access information? What if a Starbucks-iBookstore connection is ALREADY in the works, set for debut on April 3??? I caught my breath and decided to take a few pictures. When I returned to my seat I saw that in the window just behind where I had been sitting was Starbucks Library version 1.0. Next to the window, a sign said simply: "Read 'em, share 'em, return 'em". And can you believe it, the children's section featured Go, Dog. Go!. I'm looking forward to version 2. Starbucks will need to work on their metadata- the song I was listening to wasn't Emilíana Torrini at all. Still, when the wind blows after a hard rain, some trees will come down.